Your vehicle will sparkle like a sapphire after using Sapphire PreWax Cleaner by Collinite! As the old adage goes, prep is 90% of the shine. Prepare your vehicle for perfection with Collinite Sapphite PreWax Cleaner. This gentle cleanser removes dirt, film, discoloration, tar, oil, bug stains, and wax stains to clean and brighten the paint before sealing it under a coat of glossy wax. 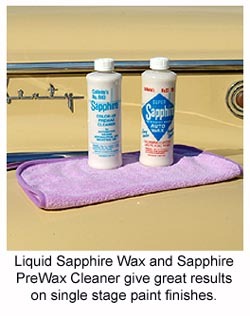 Sapphire PreWax Cleaner #840 has similar cleansing characteristics to Collinite’s Sapphire Waxes but without the wax. Sapphire PreWax Cleaner will appeal to enthusiasts who enjoy the multi-step process of cleansing, then waxing. Sapphire PreWax Cleaner #840 is intended for paint that is well-maintained and that doesn’t need any additional swirl removal or polishing. This cleaner is designed to prepare a vehicle for a fresh coat of wax by removing old wax and any stubborn contamination that washing didn’t remove. Sapphire PreWax Cleaner #840 doesn’t stop at the paint. Use it on chrome and aluminum auto accessories, lacquered or varnished furniture, enamel, and chrome appliances. It will clean and brighten all these surfaces, leaving a smooth, uniform appearance. To apply Sapphire PreWax Cleaner #840, you may find it easiest to apply by hand since it will need to be buffed almost immediately. For machine application, use a polishing pad on your Porter Cable 7424 and work at a low speed. Apply #840 to no more than one panel at a time before buffing. 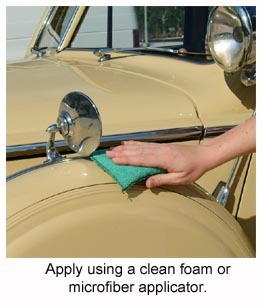 Since it is a cleaner, there will be some transfer from the vehicle onto your buffing cloth. Therefore, use a Cobra microfiber towel so you can easily flip it when one side becomes dirty. If you do opt for a bonnet, make sure you have several on hand and keep an eye on its condition as you work. This is a chemical cleaner with no abrasives or protective properties. Always follow it with a wax. Collinite Insulator Wax #845 or Super DoubleCoat Wax #476 will both create a long-lasting, protective gloss. Enhance the gloss and clarity of your favorite Collinite wax by first cleaning the paint with Collinite Sapphire PreWax Cleaner #840. *Note: Collinite Liquid Sapphire PreWax Cleaner #840 is formulated for single stage, enamel, and lacquer paint finishes. For clear coat paint, use Pinnacle Paintwork Cleansing Lotion.